Southampton beat Liverpool to set up a Milk Cup Junior final against Right to Dream while Co Antrim will face Club America in the Premier decider. 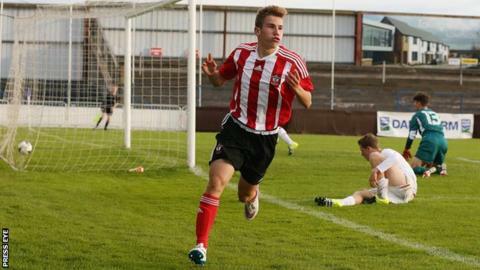 The Saints impressed in a 3-1 win over Liverpool at the Coleraine Showgrounds, with Jake Vokins bagging a double. Ghanaian side Right to Dream beat Co Antrim 2-0 in the other Junior semi. Co Antrim fared better in the Premier semi-finals, overcoming Real Sociedad 2-0 while Club America beat CSKA Moscow on penalties after a scoreless draw. Matthew Shevlin scored both goals as Co Antrim defeated Real Sociedad at the Riada Stadium in Ballymoney. Shevlin met Ryan Nimick's cut back to fire in a second-half opener and he added the second just over a minute later. A classy run and finish saw Shevlin slot past keeper Inaki Auzmendi with a composed finish. Mexican team Club America won their penalty shoot-out 5-3 against CSKA Moscow in Limavady. An own goal from Andrew Jackson put Southampton ahead against Liverpool and it was 2-0 at half-time thanks to Jonathan Afalabi's bullet header from a corner. Jake Vokins drilled past keeper Louie Molden to make it 3-0 before Neco Williams netted for the Anfield lads from a goalmouth scramble. Right to Dream defeated Co Antrim in Portstewart and they will face the Saints in Friday night's final at the Ballymena Showgrounds.